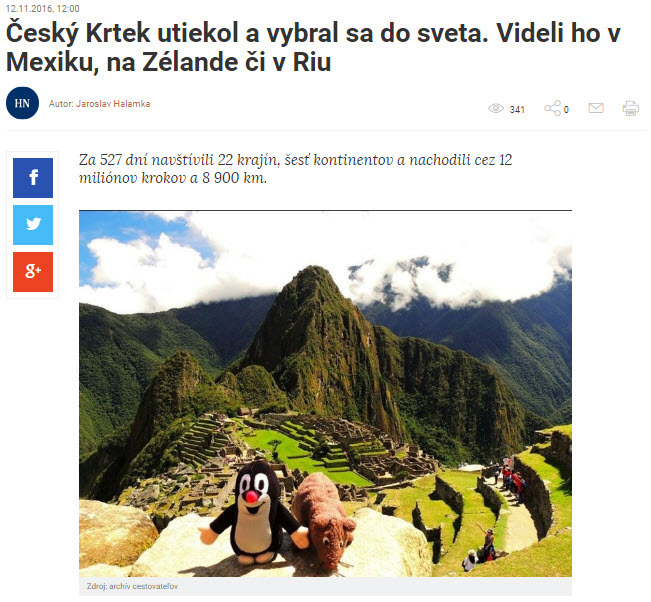 Our previous interview was very interesting for one of the major newspaper in abroad in Slovak Republic 😉 Although this is translation of the interview even though we are pleased that the mentioning about Little Mole got to our former compatriots! We like Slovakia, we like the Slovaks and they like Little Mole. That’s the way it’s supposed to be. 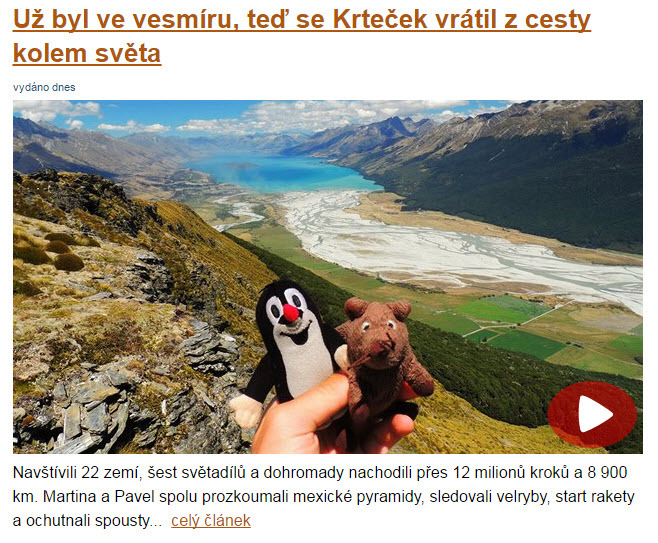 You can read the article here “Czech Little Mole went to see the world. He was seen in Mexico, New Zealand or Rio“. Getting to know North America and meeting amazing people. Follow up article from Karlovarsky Denik really pleased us. It describes our wandering around Mexico, time we spent with people but also our explorations of archeological sites and pyramid complexes. Either it does not miss out our travelling in the US coast where we received help from many Czech people with whom we felt like back home but as well as Americans who gave us great shelters and provided us with tips for further trips. More about it you may find in the article “Travelers are behind the American continent. Part II“. How we travelled South America and ate guinea pig. VAnother article about us has been issued and briefly you can learn about what countries we travelled in South America, what transportation we used and what food we tasted within our trip around the world. 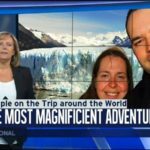 Details can be found in the article “Travelers are behind the American continent. Part I“. To be continued. Walking like crazy, we have walked more than 3 million steps! Karlovarský deník follows our wandering in the world and we are happy about it. This time you find out more about how Russian people are everywhere and that walking around the world is more than healthy. If you wan to know more raead about how we “Walked three million steps and visited Vietnamse Carlsbad“. And we decided to help even more! iDnes.cz announced a photo contest about the best summer morning photography. The prize was the voucher to Aquapark nearby Prague. 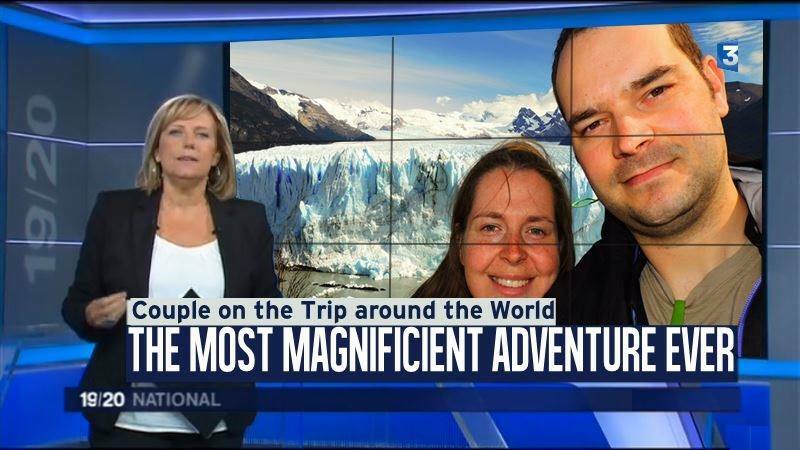 Well for us it was not that important because we have so many amazing experiences within our round the world trip anyway. But we said let’s do it and we have won! Prize won in a photo contest was given to a family from Carlsbad whose little girl Adelka won a fight over a really serious illness. We truly believe they are gonna have a wonderful day in the Aquapark. On the trip around the world we decided to help! Karlovarský deník was so nice that they decided to suport us in our nice act. 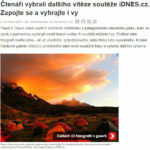 They wrote another article about us, mentioned our travelling, how we got to the USA but also confirmed they agree that “Every little may help people in need“. Heading towards Rio and trip around the world has begun! We were pleased because we were lucky that even Krkonošský deník was curious about us. During our final preparations, packing and saying goodbye with a family we met the editor in her office in Trutnov and for the first time in our lives we provided an interview. Till the last moment it was a surpise for us. 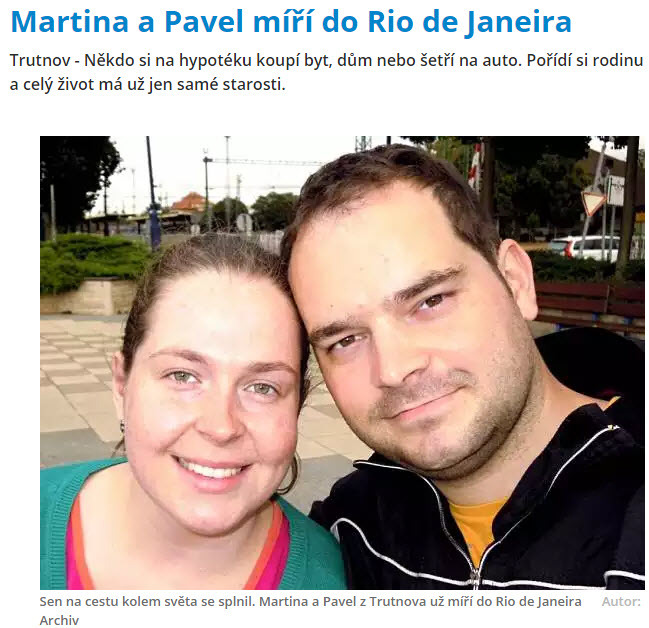 About how “Martina & Pavel are heading to Rio” we read really when we were already on the way. 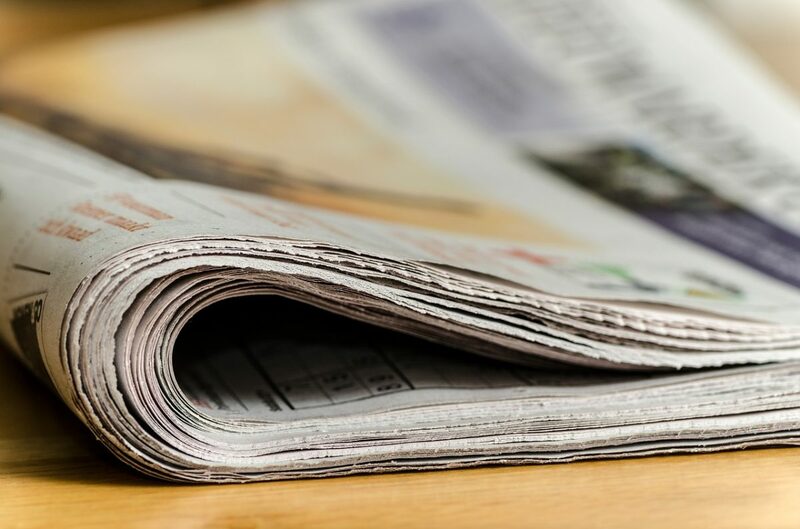 And here it is, we are first time in the newspaper, first mention about us in the media! 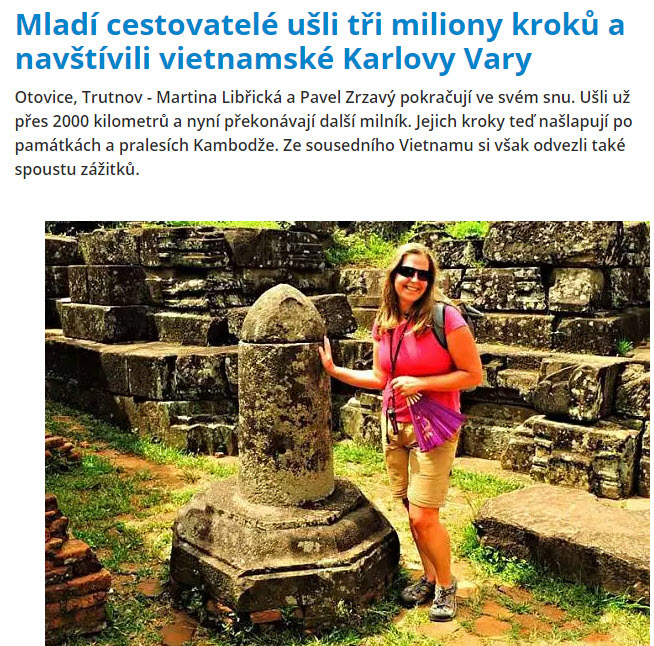 Karlovarský deník wrote an article about our trip around the world, about us and our plans and dreams we wanted to come true by travelling. How much excited we were and how the first mention about us was like you can find in the article “Around the world within 16 months“.